The first time I saw François Truffaut’s The 400 Blows (1959) was probably similar to the way most people my age see the movie. It was the first of two films I watched illustrating the French New Wave in my film history class. I had seen Jean-Luc Godard’s Breathless (1960)on my own time a few years ago, and his Vivre Sa Vie (1962) last year in my Intro to Film course, but neither of them had the effect The 400 Blows did on me. Here was something I felt matched the description people give to the French New Wave. It was fresh, and so real. This is not to put down Godard (the second film we watched that week was his Contempt 1963))I have found I really need to be in a certain mood to watch a Godard film, because his stuff is a lot more intense for me. It’s still very real, but I feel his films can be more political than Truffaut’s and that just puts my head in a different mindset when watching a movie. In The 400 Blows, there are a lot of little things that don’t really push plot forward, but they reminded me of something or another from the past. Who can’t smile during that scene when the opportunistic schoolboys peel off in small groups during a gym class run through the city? I think we all used to have thoughts about doing something like that during school. Then there is that last sequence where Antoine Doinel escapes the reform school and runs out to sea, ending in the famous freeze frame. We don’t know what will happen to this character, there is no sure conclusion.The entire movie is made up of moments in Doinel’s life, the ones that drive him to act in rebellion, run away from home, play hookie from school. But it feels like real life, and it is interesting enough on it’s own to not need a traditional plot or conclusion. There is a beautiful and haunting lyricism to Truffaut’s work, and to me it is just mesmerizing to watch. 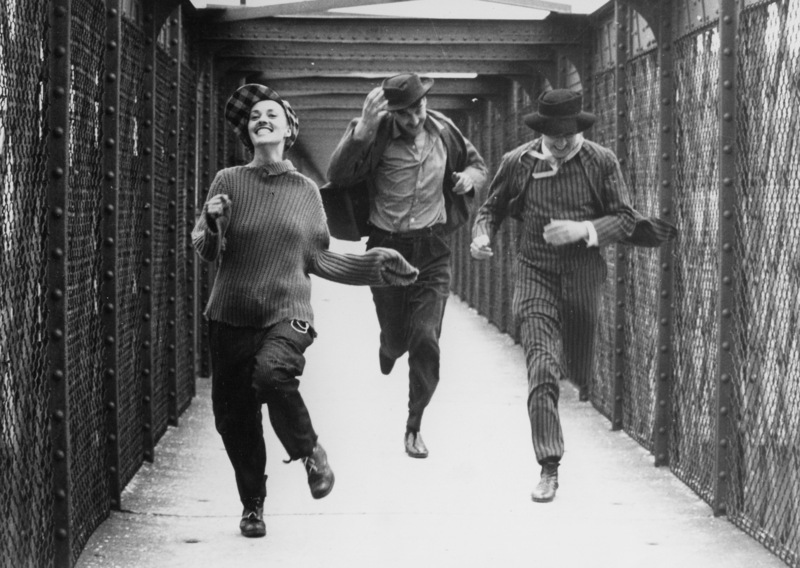 The same feelings held true when I watched Jules and Jim (1962) this past weekend. Made a few years after The 400 Blows, it is also considered a classic and standout of the French New Wave. It is a period piece, set around World War I in France. The story follows two friends, Jules (Oskar Werner) and Jim (Henri Serre), and the woman they both love, Catherine (Jeanne Moreau). Jules is quieter, and more of a cerebral type, whereas Jim is more outgoing. Catherine is a strong woman and a free spirit, and captures the attention of both men from the start. She ends up marrying Jules, and moves back to his homeland in Austria just as the war is breaking out. Because both Jules and Jim are from different countries, they fear that one might have killed the other during the war, but both come out of the conflict alive. Jim goes to visit Jules, Catherine and their daughter Sabine in Austria, and ends up staying with them. The relationship between Jules and Catherine is strained, and Jules fears she might leave them. When Catherine shows interest in Jim, Jules gives them his blessing to marry, because he would at least still be able to see her. But Catherine does not seem to be satisfied with settling down with one man, and her and Jim’s relationship starts to go the way of her one with Jules..and I won’t spoil what goes down from there, so you should just watch the movie. I am very excited to continue exploring what Truffaut did in his career. He unfortunately died at the age of 52, with 27 director’s credits to his name. I remember one time at work I told one of my co-workers, who graduated with a film degree, that I had just watched The 400 Blows and loved it, and she said, “I knew it! I knew you would be a Truffaut girl.” (I’m pretty sure she’s a Godard girl). But it’s true, I’m in love. I also love that Truffaut started as a writer for Cahiers du Cinéma, and then went on to make the kind of movies he talked about there. Within all that was groundbreaking about his and the other French New Wave director’s work, there lives a passion for cinema that all movie lovers can relate to. This entry was posted in Actors, Directors, Drama and tagged Antoine Doinel, Francois Truffaut, French, French New Wave, Jean-Luc Godard. Bookmark the permalink. your colleague is probably right when it comes to new wave, you tend to swing towards one or the other of them. whilst i’m generally drawn to the more poetic films it is Godard (and only his early stuff) that fills me with excitement. Thanks! I’m excited to officially be a part of the LAMB.